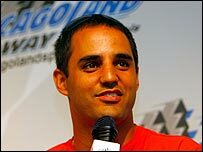 Juan Pablo Montoya will leave Formula One at the end of the season to drive in the American Nascar series in 2007. Montoya will link up with team owner Chip Ganassi, who he had considerable success with in Indy-style racing before moving to F1 in 2001. "It should be fun," said Ganassi, who added Montoya might race in some races this year after the F1 season finishes. "He said 'I want to get back to racing'. The guy loves racing. And what better place than here?" Montoya confirmed he was relishing the switch. "I am so happy to be entering the fastest growing racing league in the world," said the Colombian. "I've thought about this for quite some time but the opportunity had to be right. I know it will not be easy but I can't wait to get behind the wheel." Montoya, who currently drives for McLaren, enjoyed considerable success on the oval tracks that dominate the Nascar series when racing in America before moving to F1. He won a Cart series championship in 1999 and the Indianapolis 500 in 2000 with Ganassi. He will replace Casey Mears, who will drive for Hendrick Motorsports next season. But the history of drivers from open-wheel racing - the type found in both Indy-style racing and F1 - who have tried to move Nascar is not great. Tony Stewart left the Indy Racing League to become a two-time Nascar champion, and Robby Gordon has three career victories. Others have not fared as well, with established drivers such as John Andretti, Christian Fittipaldi, Scott Pruett, Paul Tracy, Max Papis and Jimmy Vasser not impressing. Most observers would say Montoya's ability is of a far higher level than any of those names. Even so, Ganassi said Montoya, who has a combative style of driving, will have to work hard to make the adjustment from the more cerebral style of F1 to the rough and tumble of Nascar. "It's going to be some work," Ganassi said. "He's ready for it, though."